Investing in dividend paying stocks has become a fad in recent years. Even so, that doesn't mean it's a poor investing strategy. I came across a compelling case against dividend paying stocks by David Jackson (founder of Seeking Alpha), written in June 2005. I would like to summarize his points, and offer counterarguments in favor of dividend investing. 1. Stock price appreciation and dividends are not independent. They both depend on earnings. Paying out dividends does not make a company's stock price go higher. Buying back shares and/or reinvesting in its business does. 2. Share buy backs are more tax efficient than dividends. Every dividend payout is a tax event. Even with the lowered tax rate on dividends (which may not be renewed), the Federal government can still take up to 15% of your payout. Don't forget state and local taxes. That money is lost forever. But if the company buys back its stock instead of paying out the dividend, you will pay no taxes and the stock's price will probably go higher, compounding your gains. When you eventually sell, you'll only have to pay a capital gains tax. 3. Dividends do not assure accounting safety, as some dividend proponents claim. "There is no direct relationship between dividend payments and real profits." That is, dividends do not make management more trustworthy. A company can pay out dividends and still lie about its balance sheet. 4. If the company pays out a dividend because it has no better way to use its money, you should buy bonds instead. "They're less risky and your 'dividend' is assured." Jackson concludes his article by arguing that dividend paying stocks may be overvalued. This has proved to be prescient. 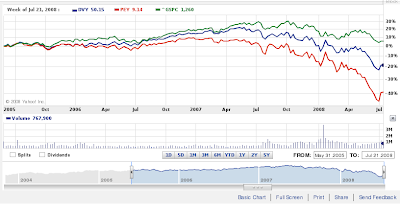 Take a look at the performance of the Dow Jones Select Dividend Index Fund ETF (DVY) and PowerShares High Yield Equity Dividend Achievers Portfolio ETF (PEY) since June 2005. S&P 500 is in green. As the chart shows, both dividend ETFs have lagged the market considerably (one reason is their huge weighting in financials). They've lagged growth stock ETFs, such as iShares' Morningstar Growth Index Fund (JKE), even more. Compelling as Jackson's case is, I disagree with him. Points 1 and 2 assume that the stock's P/E will stay about the same (Jackson acknowledges this in his article). This isn't necessarily so. The P/E ratio has a lot to do with investors' optimism/pessimism about the future, the company's earnings growth, and a host of other factors, some of which are only tangentially related to the company in question. A stock's price does not automatically rise because of share buy backs. All that happens for certain is that immediately after the buy back, the company's market capitalization lowers and the earnings per share figure rises. Do dividend payouts affect share prices? In arguing against dividends, Jackson says they do not contribute to price appreciation. In the same article, however, he hopes "that dividend hungry investors have pushed [SBC's] price up," which he was short. He acknowledges, then, that dividends can contribute to share price appreciation. Moreover, dividends often provide a price cushion for stocks. As long as the dividend is safe, dividend paying stocks will not go below a certain price, for the yield will attract new investors. The same cannot be said for stocks that do not pay dividends. (A company whose shares are falling can stop the plunge for a time by buying back shares, but as soon as it stops the price can continue declining. A dividend, however, tends to cushion a stock's fall long after share buy backs would have ended.) If the dividend is not safe, then earnings are most likely taking a hit. If this is the case, then a non-dividend paying stock in the same situation would not fare any better. Dividends, then, apparently can make share prices go higher, and can to limit the downside risk at least somewhat. Sometimes the market goes sideways or down for long periods, taking even the best companies with it. You get paid to wait with dividend stocks. If you reinvest your dividends at such times, you will amplify your future returns. Jackson thinks this kind of argument is silly, and is a reiteration of the fallacy he argues against in points 1 and 2. But is it really fallacious? Consider Apple (AAPL) from 1987 through 1997. As its share price sank, its investors got nothing. Had they owned a dividend paying stock with the same price performance, they would have gotten at least something out of it. The taxation issue is Jackson's best point. Why pay taxes on quarterly payments when that money can be used to compound returns tax free? This assumes that stocks that do not pay dividends will provide you with greater returns than dividend paying stocks, which is based on the P/E assumption discussed above. I'm not sure which would turn out to be better, the very best non-dividend paying stocks or the very best dividend paying stocks, so I will concede this point. Nevertheless, this leaves out a couple of things. First, taxation is not an issue if you keep your dividend paying stocks (at least the domestic ones) in a tax deferred account. Second, what happens at retirement? With a non-dividend paying stock, you either have to sell your entire position or portions of it for income (and you may also have to decide how best to put the extra proceeds to work). With a good dividend paying stock, however, you will not have to sell your position (or as much of it). One assumption Jackson makes is that you pick good stocks. If you pick bad companies, it doesn't really matter whether they pay dividends or not. So, supposing you pick a few good, or even great, dividend stocks, you might never have to sell them, even in retirement. That means no capital gains tax. It also means you can stay invested in stocks. People are living longer these days, after all. Who knows how long you'll need that income. And so what that you're being taxed on dividends along the way? You keep the majority of every payment. To take an example of owning a great dividend paying stock for a long time, suppose you invested $100,000 into Altria (MO) (then Philip Morris) 20 years ago. If you retired today, you would have no need to sell the stock. You would receive over $70,000 a year in dividends (more if you include payments from the companies it spun off). While dividends do not assure accounting safety (what I've called Jackson's point 3), they do make honest managers more fiscally conservative. A regular dividend (or, better yet, one that steadily rises) makes management more disciplined. Jackson (point 4) says that bonds are safer than the companies that pay out dividends because they have no better ways to use their money. I'm sure this is true in some situations. But again, aren't we talking about good stocks? If not, the point is moot. A company that has no good ways to use its money and doesn't pay dividends is worse than a similar company that does pay dividends, isn't it? Anyway, some of the best investments of all time have been dividend paying stocks. We can't say so for bonds (at least not to the same extent). Furthermore, bonds can be dangerous. While the interest payments are assured, they are fixed. Inflation can wear away at their returns. A good dividend paying stock, on the other hand, will raise its dividend payments over time. Altria is a great example. Moreover, would you want to buy bonds when interest rates are low, as they are now? A dividend paying stock may be safer. When interest rates rise, bond prices fall. If you buy bonds before the rate hike, you'll either lose money selling them or be stuck with the low yield. The dividend paying stock may fall too, but it has the potential for dividend increases, which the bond does not. And the non-dividend paying stock? It's subject to the whims of the market, just as the dividend payer. But you get nothing for your trouble when its price drops. Finally, note that dividend and non-dividend paying companies often have very different sorts of businesses. For example, compare companies like Pepsi (PEP), Johnson & Johnson (JNJ), and Procter & Gamble (PG) with companies like Apple (AAPL), First Solar (FSLR), and Research in Motion (RIMM). The latter group must constantly innovate not only to grow, but to survive. The former three, on the other hand, can sell the same product for years. Their success does not depend as much on new product launches. All this is to say that the best dividend paying companies, for the most part, are well established businesses with cash to spare. They have a degree of safety that non-dividend paying companies do not. This does not mean that their shares perform worse than those of companies that reinvest every extra cent. For instance, compare Pepsi's performance with Apple's from when Apple first started trading in the early 1980s to present. You would have been better off owning Pepsi. If you had invested $100,000 in Pepsi at Apple's IPO in December 1980, your investment would now be worth over $5.2 million and you would receive over $135,000 in dividends this year (this excludes the companies Pepsi spun off, which would add to your capital gains and dividends). From this point on you would more than double your original investment every year. There would be no point in selling the stock at retirement. If you invested the same amount into Apple at its IPO, on the other hand, it would be worth around $4.5 million today. Not bad at all. But as you wouldn't receive any dividends, you would have to sell shares for income. Please note that this is just one example. Nevertheless, it shows that dividend paying companies do not necessarily underperform those companies that reinvest all their profits. Dividend stocks should not be discounted. The best stocks are those that you never have to sell. They buy back shares, reinvest in their businesses, grow earnings, and have enough left over to regularly pay shareholders.